Hoes. They seem like such simple, basic tools, some with designs not changed for eons, others newly fashioned, but yet still simple. But even simple hoes can teach us lessons about gardening, and about life. 1. Sharp hoes work better than dull hoes. As a gardener, you’ll work better, too, to if you are mentally and physically sharp. 2. A hoe gets dull with use, so every once in a while you have to stop and sharpen it. The same is true of gardeners. Over time, all work, even in the garden, can dull the senses and wear you down. Sharpen your gardening senses by getting out of your own garden every once in a while to see what else is going on in the gardening world. Visit other gardens, read good gardening books, check out your favorite garden blogs, talk to other gardeners. Or, gasp, you might even get out of the gardening world to see what else the world has to offer to sharpen your senses. 3. A hoe just hanging out in the shed doesn’t get anything done. Often gardeners just hang out waiting because they think it might rain or it is a bit cool or a bit hot or whatever. Stop waiting and making up excuses. Get out of the shed and go out into the garden where gardening gets done. 4. Not every hoe can do every kind of hoeing; some are good for breaking ground, others for weeding in tight spaces. No gardener can be good at every kind of gardening task that there is to be done. It’s frustrating using a small hoe to break up the ground in a large area, and equally frustrating to use a big hoe to do weeding in tight spaces. Avoid your own frustrations in the garden by figuring out what you are good at, and consider hiring out or trading with someone else to do the other work. 5. Different hoes work in different ways. Some hoes work as they are pulled toward you, a few do their work as they are pushed through the soil, and still other hoes work in both directions. Every gardener works in different ways, too. You can watch how other gardeners work, but for many gardening tasks there is no right way or wrong way. You should find your own best way to work in the garden, to get your best results. 6. A clean hoe lasts longer. If you take care of your hoes by cleaning them after use and storing them properly, they will last longer. You will last longer, too, if you take care of yourself. After a long day of working in the garden, clean yourself up, eat right and get some rest, then you’ll be ready for the next day in the garden. And that's six gardening lessons from the hoes. Tomorrow is the much anticipated Garden Bloggers' Hoe Down. Join me by posting pictures of your garden hoes (or rakes or shovels) and then leave a comment on my hoe down post so we can find you. It should be a fun day! You have nearly convinced me to give my hoe another chance. I have a bit of a phobia about hoes - the handle is so long, it needs sharpening (I haven't worked out how to do that yet). I also get put off by the comment that you shouldn't hoe if rain is forecast as the weeds regrow - I live in the west of England if it is not raining then the weeds are not growing! I think you are trying to tell me to give it another go or get one of the short handled hoes - I liked the round one you have. If I do get to use a hoe, I do know that I will be thinking of you! Thank you for a interesting post. The clean hoe thing doesn't happen much here. The poor things have to fend for themselves. Hi Carol, our post is up for your hoe down. Thanks for sponsoring this shindig! Wonderful lessons learned! It takes a special kind of thoughtfulness to learn from observation and then be able to articulate what you have learned and pass it on. Following your example, I'm going to take my hoe in hand and ponder its lessons. Perhaps it is "Out of sight, out of mind." Poor neglected thing. I have a mattock. This short handled two headed mutant of a hoe means work. No wonder we're not well acquainted. I think you've convinced me I need more hoes - and I know my garden needs more gardeners! Carol, I almost forgot and I wanted to take part in this. My post is up. Lots of fun!!! When I announce: "I'm taking my stick for a walk", it used to mean picking up a 4-iron and hitting a golf ball through the fields. Now it means getting our one and only hoe out and shuffling it round the garden. You are quite a motivator. It's nice to learn from the hoes, Carol. They are a very sensible bunch indeed. While not a hoe kind of person myself, I will be following the hoe-down with interest. I don't use hoes much myself either but what lovely lessons learned! Wonderful post. I'm getting ready for a big trip so I won't be able to participate, but it will be wonderful to come back and see what everyone's done! I've got a broken hoe. The head falls off and I have to put it back on after every 3rd stroke. I've had it for about a decade and it has been this way for as long as I can remember. I can't wait to photograph it tomorrow! I should probably replace it you think? Carol, this is a great post with wonderful lessons from your hoes. You'll be glad to know that I actually did find a hoe in my garage while I was cleaning it out the other day! Alas, it's nothing worth photographing... sorry. But at least you know I have one. Right? Sylvia, Thanks for the nice comment. I do find that I do a lot of my weeding with short-handled hoes (hand hoes) and more of the soil busting with the long-handled hoes. Lisa at Greenbow, Yes, even here at "Hoe Heaven" some of the hoes don't get washed down after a day in the garden. Frances, Thanks for joining in the "shindig". MSS @ Zanthan Gardens, What a nice "make me feel good" comment. Thank you. I saw your hoe post; not sure what that hoe taught you but my, it is fancy in that boot. Karen, It's not to late to go out and show your hoes some attention! Joco, Yeah, a convert! Hoeing can be relaxing, can't it?! Jane Marie, It's okay to be early, but sorry you had to rush around. 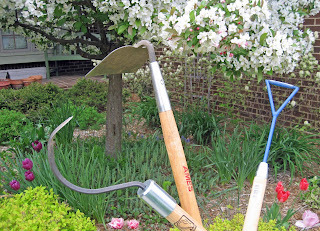 Pam/digging, Yes, and every gardener should have at least one 'sensible hoe'. Cinj, I wonder what lessons will learn from the hoes at the Hoe Down? Shirl, Thanks, hoes can be motivating! Melissa Mannon, Yes, I think if your hoe can't keep its head on straight, it is time to replace it. Blackswamp_Girl, Which raises the question. Is just having a hoe enough? Or is it better to have it and use it? Ha Ha this is very funny, have you read my "12 signs your a Garden Hoe"? I hope it is good for a reciprocal laugh! I found this post through LinkWithin (isn't that a great widget? ), and enjoyed it. I like the last one, about taking care of ourselves. As a mom working full-time from home, I garden for therapy, so try not to take the weeds and overgrown areas too seriously. But inevitably, I push myself too far at times, and end up suffering for it. Balance is good, and knowing when to call it a day.